Wilmington – At Brandywine Hundred Fire Company, Governor Markell signed House Bill 21 and House Bill 22 today to protect volunteer emergency responders from employer discrimination or discipline stemming from their volunteer responsibilities. The legislation, which stemmed from an incident in which a Delaware firefighter was fired by a private employer after sustaining burns to his hands while fighting a house fire, was sponsored by Representative Debra Heffernan (D-Brandywine Hundred South). Senator Harris McDowell (D- Wilmington North) was the lead Senate sponsor and a strong supporter of the bills. who is absent from work due to injury sustained when acting as a volunteer emergency responder. HB 21 exempts essential state employees, members of the armed forces, members of the National Guard, hospital personnel and public utility workers. It further provides that an employer may require a worker who misses work for the above reasons to provide proof of the emergency response or injury. A second measure, HB 22, prohibits employers from discriminating in the hiring or discharging of any person because of that person’s membership in a volunteer emergency responder organization (such as volunteer firefighters, volunteer EMTs and volunteer fire police, as well as ladies’ auxiliary members). Rep. Heffernan worked with the Delaware Volunteer Firefighter’s Association and the Brandywine Hundred Fire Co. in crafting both pieces of legislation. 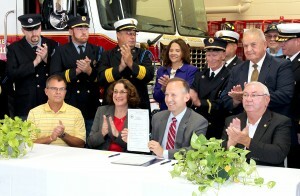 Christiana Fire Company Chief Richard J. Perillo also played an integral role in the development of the legislation.